Umiのいえ～いのち・こころ・からだ・くらしの学びあいの場～横浜: 6/1　小児科医　堀内勁先生のお話会「おっぱいとごはん、子どもの力と親子の育ち」　★read the English blog below. 6/1　小児科医　堀内勁先生のお話会「おっぱいとごはん、子どもの力と親子の育ち」　★read the English blog below. 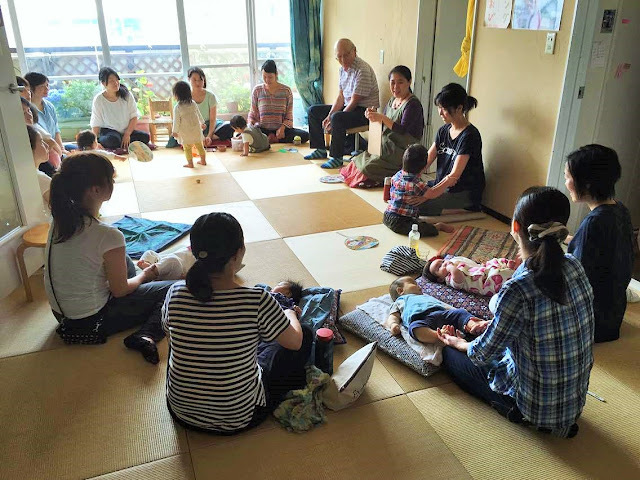 6/1 Let's ask and listen to Pediatrician Dr. Horiuchi! "The breast and food, the ability of babies and maturity of a parent and child"
Dr. Horiuch is an experienced pediatrician who gives useful advice to mons with babies, children, adolescents and young adults and adults. He is such a calm, thoughtful doctor that everybody in the room got involved in his answering the questions in a warm atmosphere. He is so nice that he could gave some advice to each mom who has worries and troubles about childcare before and after the gathering. Also "Okami"( the hostess of Umi no i.e.) Makiko san joined the gathering as a facilitator. She has raised three children, who are now at the age of 26, 24 and 21, so she told us her experiences of the childcare. After the gathering, Makiko san treated us to homemade Miso soup. It was so good. Thanks to Dr. Horiuchi and Makiko san, we participants released the difficulty and got energetic! The next gathering will be held on September 7th.